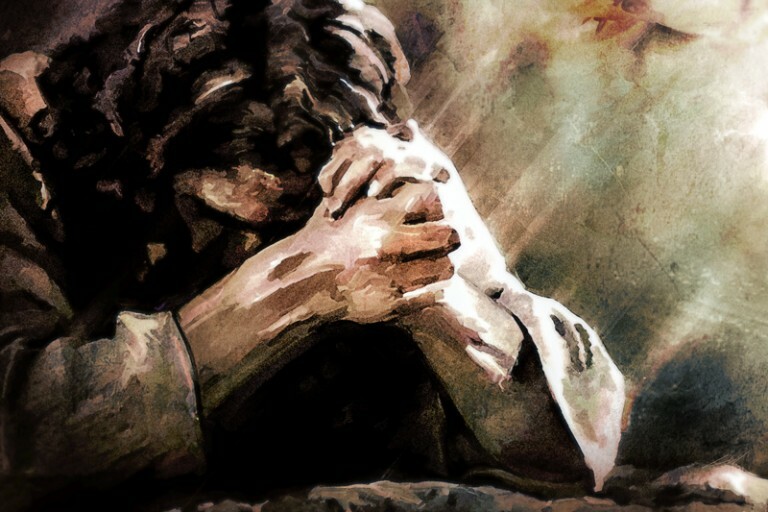 Cover image: “In Agony He Prayed” by Chad Winks. In his first recorded revelation, the prophet Lehi learned of the future “coming of a Messiah” who would bring about “the redemption of the world” (1 Nephi 1:19).1 Additional revelations to Lehi and his son Nephi shed further light on this Messiah and his mortal mission (1 Nephi 8; 11–12). Summarizing his father’s teachings, Nephi assured that “a prophet would the Lord God raise up among the Jews—even a Messiah, or, in other words, a Savior of the world” (1 Nephi 10:4, emphasis added). The form of Israelite religion likely practiced by Lehi and Nephi around 600 B.C. apparently did not use the concept of “messiah” in the specific way it was understood later in Jewish and Christian theology, and in the Book of Mormon. “One should realize that in the [Old Testament] the term ‘anointed’ is never used of a future savior/redeemer,” noted one biblical scholar, “and that in later Jewish writings of the period between 200 B.C. and A.D. 100 the term is used only infrequently in connection with agents of divine deliverance expected in the future.”5 This might explain why Lehi’s contemporaries were perplexed and even angry at his preaching (1 Nephi 1:20). Having received a revelation that “manifested plainly of the coming of a Messiah” who would bring about “the redemption of the world” (1 Nephi 1:19, emphasis added), Lehi boldly introduced a new or expanded way of thinking about the concept of the messiah. This type of innovation likely upset the religious and political rivals who opposed him and the other prophets who cried repentance to the people of Jerusalem at that time (1 Nephi 1:4, 20). Lehi saw this “One descending” (1 Nephi 1:9) not only as some generic messiah, but as “the Messiah” (1 Nephi 10:7–11). In turn, linguistic ambiguity in Lehi’s day might also explain why Nephi himself felt it necessary to clarify that the messiah promised by his father was “a Savior of the world.” This would be a universal messiah who could save all humankind, as opposed to a prophet, priest, or king concerned only with serving or redeeming the House of Israel. The Book of Mormon testifies that Jesus is the Holy One of Israel and that he condescended to succor the children of men and save them from their pains, sicknesses, and sins (1 Nephi 11:16, 26; Alma 7:12).8 For many people in Lehi’s day as well as in Jesus’s day, the idea of such a messiah was a stumbling block on which many people faltered. This concept was the foundation stone that some builders rejected. While ancient audiences could easily accept the use of the term messiah to describe a leader or holy person in their midst, it seemed inappropriate, if not blasphemous, to think that a future anointed person would become an absolute messiah, even, as Lehi said at the end of his life, “the true Messiah, their Redeemer, and their God” (2 Nephi 1:10). Due to the persistent range of answers to the timeless question, “Who say men that I am?” this bold testimony and clarification is needed no less today than it was in Lehi’s day. Book of Mormon prophets, particularly Nephi, spoke often of Jesus as the Messiah, the one “full of grace and truth” through whom redemption for all of God’s children would come.9 The Book of Mormon thus acts as a crucial second witness next to the New Testament that Jesus is in fact the Messiah, the one God anointed with power and authority to fulfill an infinite atonement (Acts 10:38; 2 Nephi 9:7). Richard D. Draper, “The First Coming of the Lord to the Jews: A Book of Mormon Perspective,” in A Book of Mormon Treasury: Gospel Insights from General Authorities and Religious Educators (Provo, UT: Religious Studies Center, Brigham Young University, 2003), 343–356. John A. Tvedtnes, “The Messiah, the Book of Mormon, and the Dead Sea Scrolls,” in The Most Correct Book: Insights from a Book of Mormon Scholar (Salt Lake City, UT: Cornerstone Publishing, 1999), 328–343. James H. Charlesworth, “Messianism in the Pseudepigrapha and the Book of Mormon,” in Reflections on Mormonism: Judaeo-Christian Parallels, ed. Truman G. Madsen (Provo, UT: Religious Studies Center, Brigham Young University, 1978), 99–137. It is interesting to note that Lehi, apparently, did not learn from his first vision that the name of the Messiah was specifically Jesus Christ. See Book of Mormon Central, “Why Does an Angel Reveal the Name of Christ to Jacob?” KnoWhy #36 (February 18, 2016). 1 Samuel 9:16; 10:1; 12:3–5; 24:6; 2 Samuel 2:4–7; 5:3, 17; 19:21; 22:51; 23:1; 1 Kings 1:39, 45; 19:16; Psalm 18:50; 89:20, 38, 51; 132:10, 17. This practice of anointing kings was also carried out by Book of Mormon peoples (Jacob 1:9; Ether 6:22, 27; 9:4, 14–15, 21-22; 10:10, 16). For examples of priests being anointed, see Exodus 40:14–15; 28:41; Leviticus 4:3, 5, 16; 6:22. For prophets, see Psalm 105:15; 1 Kings 19:16; 1 Chronicles 16:22. See the commentary in Marinus De Jonge, “Messiah,” in The Anchor Bible Dictionary, ed. David Noel Freedman (New York, NY: Doubleday, 1992), 4:777–780. See further Book of Mormon Central, “Did Pre-Christian Prophets Know About Christ?” KnoWhy #12 (January 15, 2016); “Why Did Abinadi Talk About the Suffering Messiah?” KnoWhy #91 (May 3, 2016). See further Book of Mormon Central, “How Did Nephi Read Isaiah as a Witness of Christ’s Coming?” KnoWhy #40 (February 24, 2016); “Why Did Nephi Say an Angel Had Revealed the Name Jesus Christ?” KnoWhy #304 (April 24, 2017). See also the reflections provided by Richard D. Draper, “The Book of Mormon on Christ’s Role as Redeemer,” Ensign (January 2000). See 2 Nephi 2:6; cf. 1 Nephi 10:4-5, 7, 9-11, 14, 17; 2 Nephi 2:6, 8, 26; 25:14, 16, 18-19; Jarom 1:11; Mosiah 13:33; Helaman 8:13.